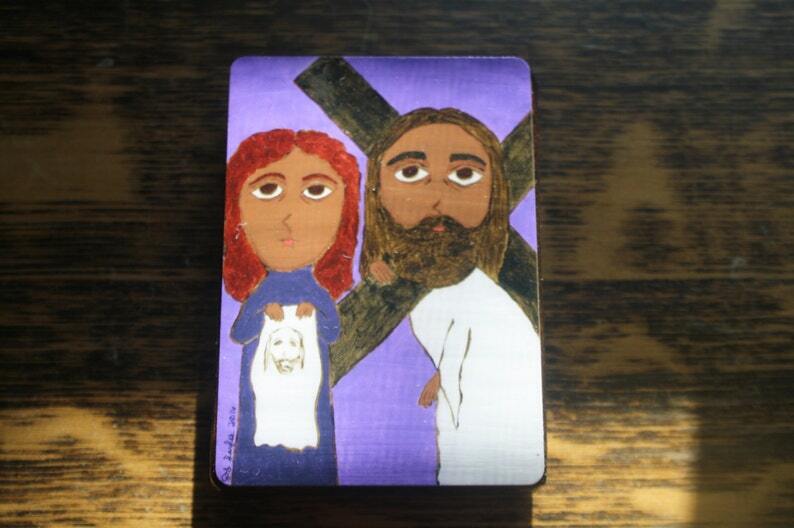 A little icon print on wood from my original painting Veronica wipes the face of Jesus. There's a little sawtooth hanger on the back. The Sacred Hearts are very well crafted and beautiful. Thank you! Beautiful! My dear friend loved receiving your hand-painted Benedictine"medal" the day he made his promises as a lay oblate! We will work with the buyer to try and come up with a remedy for whatever situation arises. We will allow exchanges or store credit within ten days of order. Will ship to United States via the US Post Office. International buyers please e-mail us for rates. Orders ship out Monday - Friday and are generally sent priority. Please note that our items are handmade so no two will be alike. Many auctions will have a stock photo and the customer will get an item that looks pretty darn close, but won't be an exact duplicate. Also keep in mind color can vary from computer screen to computer screen.